It’s that time of year again, the warm weather has rolled in & it’s time to open everything up and let it all breathe. The awning on our deck, the cushions for all the out door furniture, even the windows all around the house to let in the cool Spring breeze. Another thing that needs airing out? My electric smoker. It’s been closed up tight in the deck house for several months. I’m a lot more excited to get that bad boy out & fired up, than about beating out pillows and wiping down furniture. 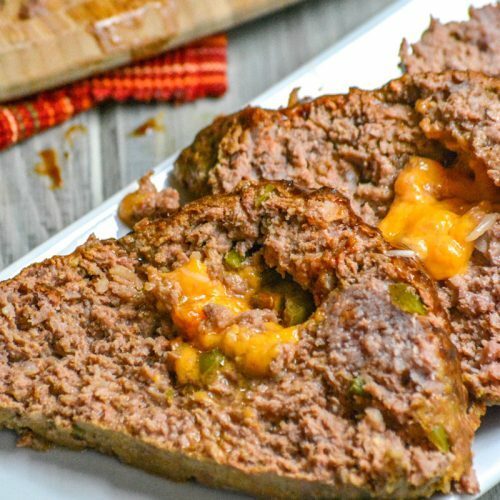 Meatloaf is a mainstay on our table all year long. We’ve got several different recipes. Both for the oven and for the smoker. Different times of year make the different ones taste better. 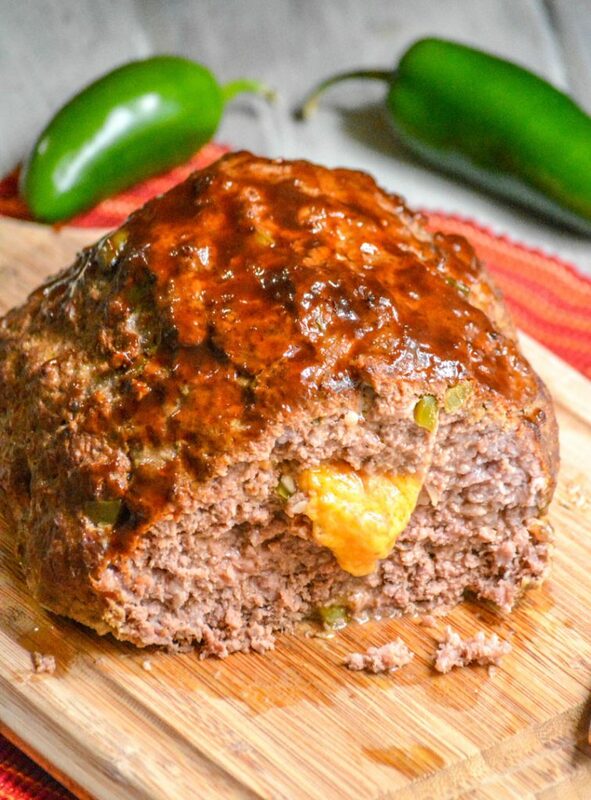 When the weather warms up though, there’s no better eating than a thick meatloaf infused with smoked flavor in every bite. 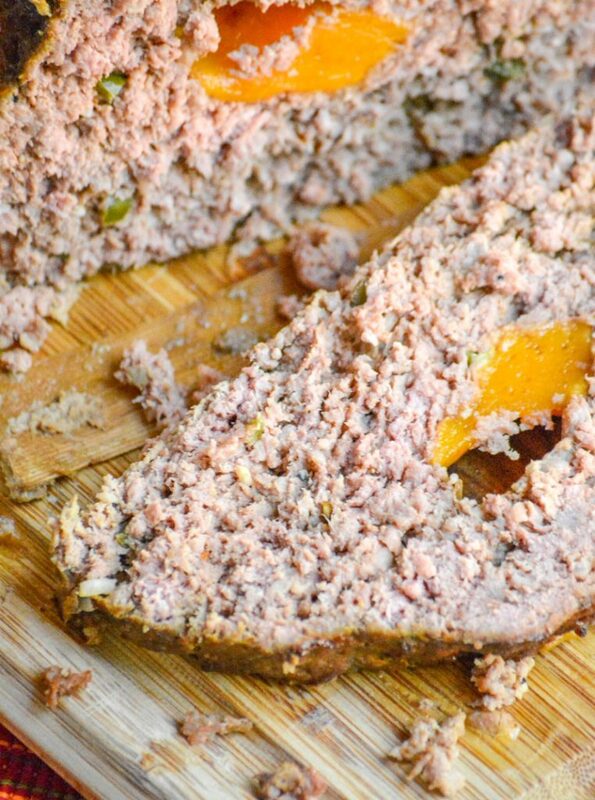 We’ve already got a Jack Daniels whiskey infused smoked meatloaf that’s a real crowd pleaser. Personally, I think one of the reasons it’s as popular as it is is because it’s also got a block of pepper jack cheese stuffed right in the center. 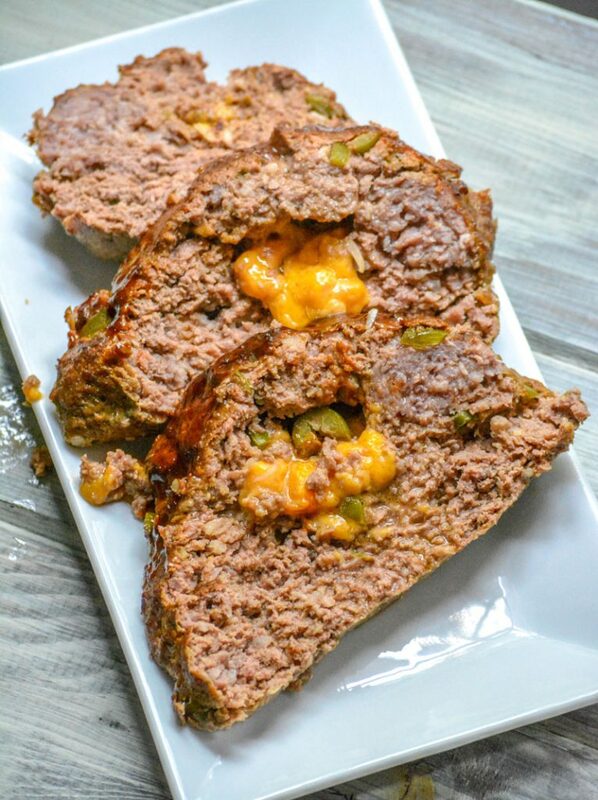 I learned years ago, when making my Grandma’s more traditional version, that a hunk of melty cheese in the middle absolutely makes a meatloaf. That one I use mozzarella in, and it spoiled my family on cheese-less meatloaf. It’s that good. 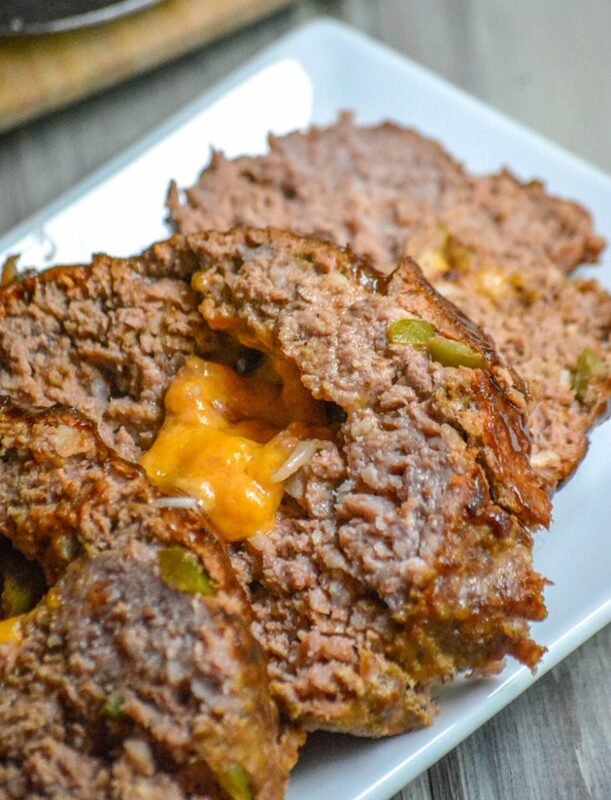 Fast forward several years, and we still can’t get over the combination of meatloaf & cheese. I also can’t get away from the smoke-infused result when using the smoker vs. the oven. It was only a matter of time until I started playing around with different versions. 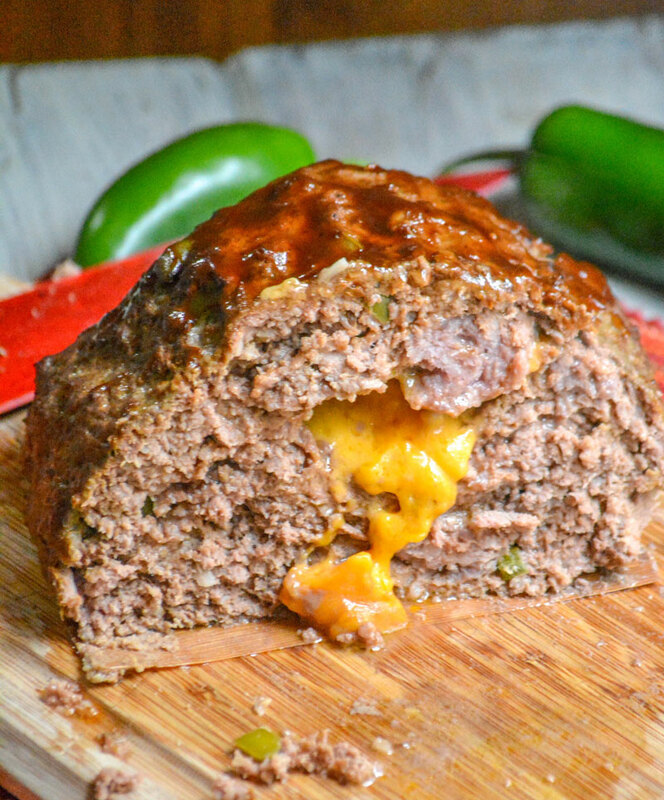 Buttermilk Jalapeno Cheddar Stuffed Smoked Meatloaf was the delicious result of just one of those many experiments. It secured it’s spot at the top of our tried & true smoked recipe list almost immediately. For this recipe, we use a blend of ground beef and spicy ground Italian sausage. You don’t have to add the sausage, you could just use all beef- but we like the depth of flavor it gives. Two beaten eggs are added to the meat mixture as a binding ingredient, helping the meatloaf hold it’s shape when bake. Buttermilk’s also added to the mixture. I know, it may seem like an odd ingredient at first. I mean it’s meatloaf, right? Trust me though, it keeps the meat moist while it slow cooks in the smoker. Nobody ever wants dried out meatloaf! White onion, pickled jalapeno, and seasonings are then added to the mixture. I love the pickled variety because it adds spice, but with less of a bite. If you’d rather have the full heat version, swap the pickled jalapeno for seeded and diced fresh ones. Now it’s time to mix the meatloaf mix up. This is a very important step. You want everything to be a uniform consistency, so there aren’t any hidden pockets of lumps of seasoning and no one gets served a slice of bland beef. You can use a sturdy spatula for this step, but the best method I’ve ever found is the tried and true- old fashioned way. Rolls your sleeves up, wash your hands well, and dig in. Squish, squash, and knead the meat mix until completely incorporated. Form the mixture into a log, and create a well in the center about as long as the block of cheese. Add the two halves of the cheese block side by side, and cover it back up with the meat. Make sure to try and seal any cracks. Slather the top with the barbecue sauce, using the back of a spoon to spread. Transfer it to a disposable aluminum baking dish. Often I put things directly on the rack in the smoker, but not this. Even when seasoned, the ground beef tends to stick in bits to the rack and it’s really sad when it falls apart trying to take it out. I also don’t want it sitting in a bath of fat & grease drippings though. My solution is to poke several holes in the bottom of the tray, and then place a regular tray directly under that one to catch anything coming through as it cooks. Preheat your smoker to 245 degrees, and fill the water pan if it has one. While you don’t have to use it, the steam it creates makes for a nice thin crust on the sides of the loaf. It’s yummy. We use a blend of maple, cherry, and pecan wood chips- but you can use whatever blend you prefer. I would suggest staying away from something super strong- like mesquite, especially if you’re new to smoking. Try to keep an eye on your smoker, and refill the chips as necessary to keep a constant smoke going during the whole cooking process. Add the meatloaf to the smoker, seal it up, and cook the loaf for 2 1/2 hours. If you want to be extra sure it’s cooked throughout, insert a thermometer in the thickest part of the center. If it reads 160 degrees F- you can be reassured it’s 100 % done and safe to eat! 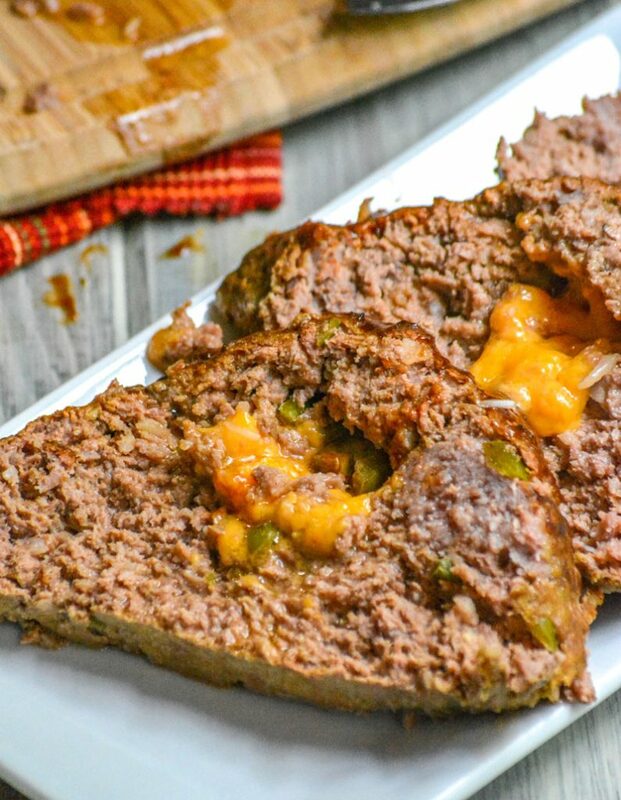 Tender meatloaf is infused with buttermilk for extra moisture, studded with spicy jalapenos, given a vein of melted sharp cheddar right down the center, slathered with barbecue sauce, and slow smoked to perfection. In a large mixing bowl, add all of the ingredients except for the cheese & barbecue sauce. Using a spatula, or your hands, mix and stir until the entire mixture's uniform and evenly incorporated. Poke holes in the bottom of a disposable aluminum baking pan. Add the meat mixture to it, and form it into a log. Preheat your smoker to 245 degrees Fahrenheit. Place the meatloaf tray on a higher shelf in the smoker, and place another whole tray directly underneath to catch any grease/drippings. Fill your smoker's water pan with water. Smoke the meat for 2 1/2 hours, or until a thermometer inserted in the center reads 160 degrees. We use a blend of maple, pecan, and cherry wood chips- although hickory and apple would also work well. Add chips as necessary throughout the cooking process to ensure a good smokey flavor throughout the meatloaf.